David B. Coe just finished a busy year in which he published three novels, two of which we discuss in this episode of New Books in Science Fiction and Fantasy. 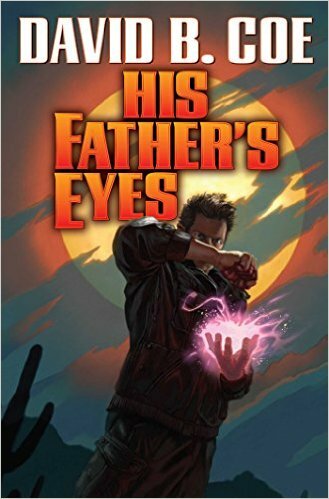 His Father’s Eyes (Baen, 2015) is the second book (the first, Spell Blind, was also published in 2015) to follow the adventures of P.I. Justis Fearsson, a weremyste whose investigations are interrupted once a month during the full moon when he slips into psychosis. Dead Man’s Reach (Tor, 2015) written under the pen name D.B. Jackson, is the fourth book in the The Thieftaker Chronicles and focuses on Ethan Kaille, an 18th century version of a private detective (known poetically as a thieftaker) who also happens to be a conjurer. While both protagonists share a number of traits (they’re both crime-solvers and both have magic powers) the series are quite different. The Thieftaker books are partly historical novel, ones in which Coe (aka Jackson) interweaves real people (e.g., Samuel Adams) and events of pre-Revolutionary Boston (e.g., the Stamp Act Riots, the Boston Massacre) with mysteries that Kaille is trying to solve. “I spend an enormous amount of time searching for these tiny historical details to bring the verisimilitude to my story,” Coe says. Kaille’s opponents (who include those who would like Kaille to meet the same end as the alleged witches of Salem) are external. But the eponymous protagonist of Coe’s Case Files of Justis Fearsson series faces an internal enemy: the monthly psychosis that accompanies the full moon. These episodes are gradually making Fearsson permanently insane, as they did his weremyste father. Here is a blog post in which Coe interviews his two protagonists from the separate series, Justis Fearsson and Ethan Kaille.